Please contact Cupcakes 101 at (603) 488-5962 to place orders for custom candy basket! We look forward to hearing from you! 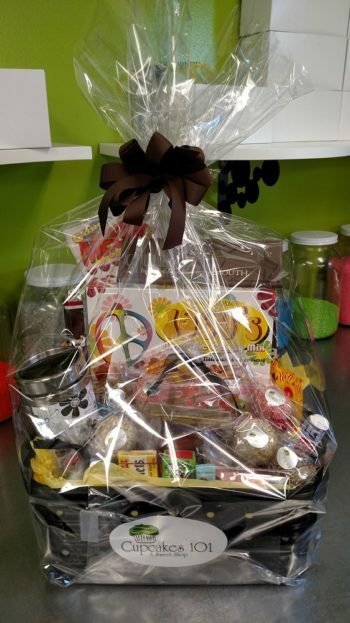 Candy Baskets make great gifts for Birthdays, Holidays, Corporate Gifts and more! Cupcakes 101 gift baskets come in small, medium and large and can be customized to fit your specifications. Don't forget Easter is Sunday, April 21st. We will be open Saturday from 11:00 am to 3:00 pm. Don't forget your dessert for Easter, or unique candies, cakepops, a cakepop bouquet, or a small easter basket for that special someone!! Flavors for Easter at Cupcakes 101 are Cadbury Creme, Cadbury Mini Egg, Carrot, Coconut Chocolate, Funfetti, Hostess, Peanut Butter Cup, Peeps, Red Velvet, Vanilla and a Glute-Free option! !